During my childhood, my family would visit nearby restaurant, Organ Piper Pizza. Fascinated by how the organ worked and sounds it produced, I immediately grew interested in the Theatre Organ. In 2010, I purchased the first part (Wurlitzer Xylophone) of what would become (as my wife describes) a serious hoarding issue. Several years later, after joining the local chapter of the American Theatre Organ Society (Dairyland), I had an opportunity to save an organ from the dumpster. This organ (Wurlitzer Opus 1872) came out of the Racine Theatre Guild building in March of 2013. Thanks to several friends, the whole organ was removed, crated and stored in only a day and a half. Opus 1872 was originally installed in the Capitol Theatre located in Racine Wisconsin. Originally a 2/5, 150 Special shipped from the Wurlitzer factory on April 24th, 1928. 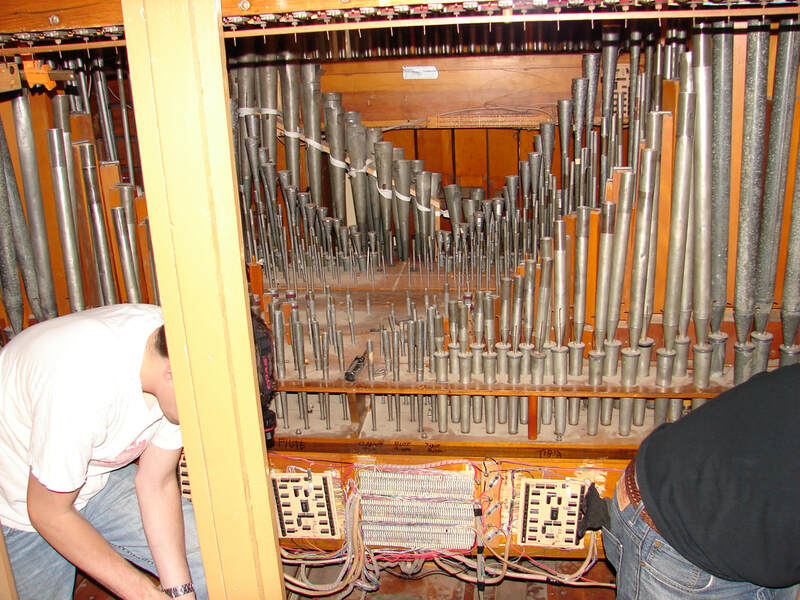 In 1981, the organ was removed from the theatre, installed at the Theatre Guild and dedicated on February 21, 1982. This move was made possible by donations from Mr. and Mrs. Lowell McNeill and the Dairyland Theatre Organ Society who contracted with Frederick Johnson Organ Builders to reinstall it complete with a modern solid-state Z-Tronics Relay. "Dale was born in Fort Madison, Iowa on August 12, 1925, the son of James R. and Ruth I. (Weinberg) Williams. He graduated from Austin High School in Chicago, Illinois in 1943. On September 7, 1947, Dale married Lois M. Weintz in Chicago, Illinois. In 1973, the family moved to the Whitewater area. Dale and his business partner began the Verlo Mattress Company in 1967 in Chicago, IL, which was named in honor of their wives and was the combination of the partner's wives names Verna and Lois. Dale built and flew airplanes and loved carpentry including crafting violins and furniture making. He put together and played a pipe organ as a hobby." This console began life in 1931 when it was installed in the Madison Gardens Rink. Opus 2165 was an 8 Rank organ, voiced on 20" of wind. In 1950, the organ was moved to the Hub Rink in Chicago where it was played by Leon Berry before getting removed by Leon to make room for their new three manual console. Shortly after Dale's passing, a friend put me in contact with Dale's son Dave who was handling his father's estate. After a tour and playing of the organ a deal was reached and it was again time to call on several friends to assist in the removal of organ number two! Without the help of many hands, projects like this simply aren't possible! ​The first step was to build 14 pipe crates followed by getting on the phone and rallying the troops again. This time it took two solid days of hard labor but we were able to get it done! Check out the photos page for more pictures of the removal. Fast forward to February of 2017, when Dale's console was moved into my garage where it would undergo a re-specification. Several tabs were ordered from Hesco to accomplish this task. There were also several components that were bad which were swapped out and tested before getting moved into the house. Since the organ came with Z-Tronics relay boards I decided to stick with that relay system. Ultimately the plan is to re-install the pipes from both Dale's and the Racine Theatre Guild's organs. At the present time, my plan is to construct a music building behind our future house. Until then, the console will be used with Hauptwerk to play sounds virtually. In order for the console to work with Hauptwerk I needed to order a few extra Z-Tronics boards to interface the console with my computer. Fast forward to December of 2017 when the boards arrived, the following card rack was constructed to house the relay. With this card rack wired, the console will now work with Hauptwerk in addition to be setup to control the actual pipes during the next phase of this project. After spending Christmas Break wiring, the console was ready to be moved into the music room and a short list was created of small things to fix. The console performed well for DTOS' Valentine's Social on February 11, 2018 - it's first public "appearance" since removal from the William's Residence. See photos of the transformation on the photos page.